I am a recent customer and now fan of GEEKS UNLIMITED! I saw the GEEKS UNLIMITED ad in the local Yellow Pages and picked it out because of its fearless slogan -- "We Fix Computer Problems. GUARANTEED!". I received a call back from the technician almost right away, and he offered to make a housecall that same day. Not expecting such a brief response time, we set up an appointment. He was prompt, professional and courteous; didn't rush through his diagnosis but was considerate not to waste any time. He explained the problem and solution concisely and matter-of-factly, with patience for any of my concerns. We sent our PC with him for a complete Operating System wipe and reload, and he returned it less than 24 hours later, not just good-as-new, but much, much better. All of our software, data and settings were restored, complete with updates and some useful new tools to help prevent future issues, before they occur. We could not have asked for or imagined a better, more complete service from anyone; the technician truly went beyond any expectations. 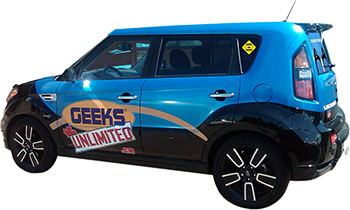 "GEEKS UNLIMITED went above and beyond all expectations during their service visit and in all correspondence before and after. The tech was easy to reach and quick to respond; essential for the computer service industry. He was able to rapidly assess and solve the problems our company (non-profit) was experiencing. The pricing was fair and the solutions were promptly installed and effective. A follow-up phone call was much appreciated. I would not hesitate to recommend GEEKS to other businesses, friends or family. " "We have been using GEEKS UNLIMITED as our dedicated computer technicians for a number of years now, and have always been completely satisfied with the service they have provided, and I have often recommended their services to others. Their knowledge is extensive and they have always been open to suggesting ways in which our computer system might be better structured for increased performance and to save us money. Our association with GEEKS will hopefully continue for a very long time." "I am in the automotive after sale business which is a service related business and would like to say that prompt, knowledgeable, courteous service is # 1 on my list and GEEKS UNLIMITED were all the above... and even more importantly they were easily accessible when I had questions after the service call"
“Thanks again for the excellent service with the computer. I'll remember to listen to your advice next time! It will save me some money! I'll give GEEKS a call the next time I need service. In the meantime, it's working great!" “Thank you GEEKS UNLIMITED. If we have another computer problem, we'll call the GEEKS first without even thinking twice. “We just wanted to say a special "THANK YOU!!!!!" for all your help with the problems we've been having!!! As far as we are concerned, NO ONE ELSE will touch these computers! Going above and beyond the call of duty, doesn't even begin to describe what you have done for us! We don't feel we could have gotten any better service anywhere! It's reassuring to see people who are not "in it for the money", but for the customer. We've had others pretend to fix our system, only to have to call them in a few days or weeks and have them come back and fix something else they should have found the first time. We've even had incorrect components installed in the system by those same people! Talk about job security! As we stated above... Thank you... for being honest, prompt, helpful, thoughtful and for just being there when we need you!